LIMITED EDITION Rustic and chic, this must-have chess set is a true work of art to be appreciated by wine lovers and chess players alike. The board is handmade from a full size recycled California oak wine barrel, complete with authentic metal hoop. 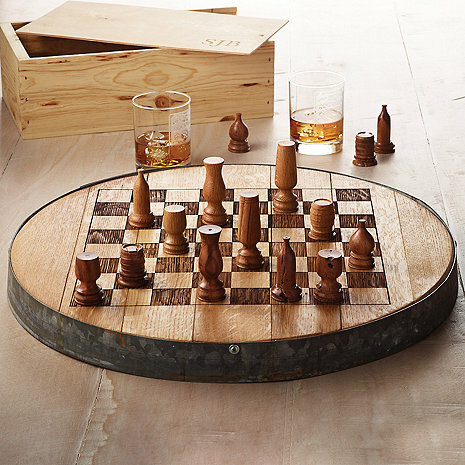 Each playing piece is handcrafted from 100% reclaimed wine barrels and old grape vines. Every set is unique due to the inherent distinctive markings of the oak barrels and grape vines. Pieces safely store in handcrafted, monogrammed keepsake box. Can you buy just the chess pieces? BEST ANSWER: The chess pieces are sold only in the set with the barrel head board.